With the start of college basketball just weeks away, we’re breaking down Michigan’s roster player-by-player. Today we start with sophomore wing guard Aubrey Dawkins. Aubrey Dawkins played just 63 non-conference minutes last season. Then after playing just five minutes per game, he came off the bench and scored 20 points on 6-of-7 three-point shooting in the Big Ten opener against Illinois. Dawkins would go on to reach double figures in eight of 20 Big Ten games — with a season high of 31 points against Rutgers — as he suddenly emerged as a legitimate scorer in the Michigan offense. By year’s end, Dawkins was the best shooter in Big Ten games — making 51% of his twos and 48% of his threes for a league-best 63.3 eFG% — and he had gone from long-term project with potential to a core part of Michigan’s present and future. Dawkins proved to be an elite catch-and-shoot player from the wings. He shot 51% from the left corner and the left wing — the two spots where he spent the majority of his time offensively. But two-thirds of his field goal attempts were threes and he didn’t do a lot more offensively. Beyond catch and shoot threes, the one thing that Dawkins did very well was knock in mid-range jumpers from the elbows. He shot 50% on those attempts and is able to use his athleticism to get great lift on his midrange jumper. Dawkins’ 31 point performance (on 15 shots) against Rutgers does a great job of summing up everything that he brings to the table. Dawkins was automatic from three-point range in that game — off the catch, off the hand-off and most importantly in transition — while he also chipped in a few finishes at the rim and grabbed just one rebound in 37 minutes. As a program, Michigan has largely defined itself by its player development over the last five or six years. Because we’ve seen Trey Burke, Nik Stauskas, Caris LeVert and others make such impressive gains between March and November, it’s become something of a badge of honor to be named the most-improved Wolverine every offseason. Aubrey Dawkins appears to have earned that honor that’s arguably the biggest reason for excitement. Before Michigan’s first practice this fall, Dawkins also discussed how he’s starting to understand the game more clearly. Dawkins played 154 minutes and averaged 2.7 points per game while Caris LeVert was healthy last season. Michigan’s offense often looked like Caris LeVert was playing 1-on-5 last season and it was clear he just didn’t have enough of a supporting cast. Zak Irvin was streaky, Derrick Walton was hurt, Kameron Chatman couldn’t hit shots and Michigan’s other freshmen simply weren’t ready. 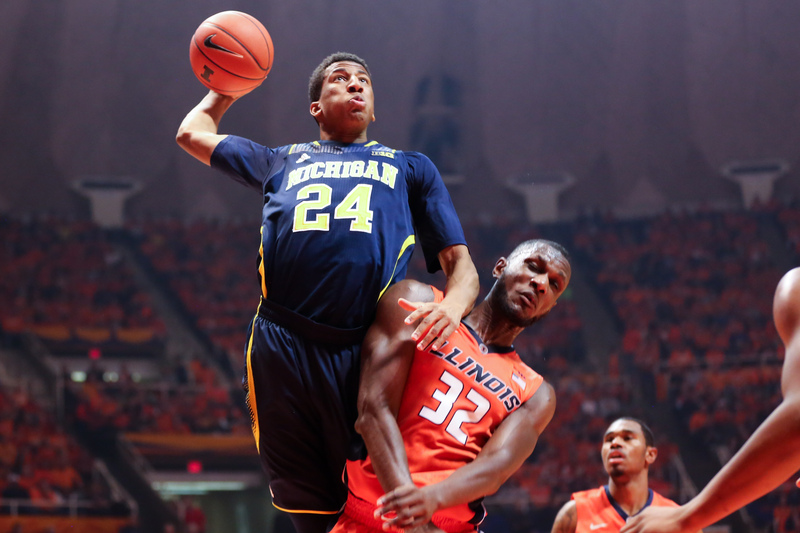 Aubrey Dawkins is the sort of weapon that can open everything up for a playmaking guard like LeVert. You can’t cheat off of him defensively to help against the drive and he can also provide an outlet as a baseline cutter and finisher off of dribble penetration. It should come as no surprise that one of LeVert’s best games of 2015 was against Illinois when Dawkins caught fire from three-point range and enabled LeVert to make 8 of 14 two-point attempts. Dawkins did plenty during his freshman season to show promise. He scored, he dunked and he made big shots in big games. He also didn’t play much defense and was rarely seen near a rebound. Michigan’s roster is deeper this year and Dawkins isn’t the only shooter available. If he’s going to be a 30+ minute per game player in 2015-16, he’s going to need to play better on the defensive end of the floor. Dawkins had the lowest defensive rebounding rate on Michigan’s roster — grabbing defensive rebounds at a slower pace than even Spike Albrecht with a bad hip. For a player with arguably the most raw athleticism on the Wolverine roster, that’s not an acceptable statistic. The difference between playing a microwave role off of the bench and being a thirty minute per game starter is going to come on the defensive end. Can Dawkins eliminate mental mistakes defensively and be more aggressive on the glass? If he can do that then the last wing starter position could be his. If not, then you start to look at other possibilities. Duncan Robinson can reportedly shoot it as well as Dawkins, Kameron Chatman is a better rebounder and passer, and the list of possibilities and platoons goes on. Including Aubrey Dawkins, six players managed a 30-point performance in Big Ten play last season. The other names on that list were DJ Newbill, D’Angelo Russell, Terran Petteway, Frank Kaminsky and Andre Hollins. That’s impressive company and while Dawkins isn’t mentioned in the same breath as any of those players for good reason, his explosiveness offensively is a reminder of just how effective of a weapon he can be. As we attempt to preview this season, we’re left with the challenge of projecting how roles will change and how players will react. Michigan brings back nearly its entire roster, but we’ve never seen the roster play together in their current states. Aubrey Dawkins certainly had a stretch assignment last year as he was playing essentially 35 minutes per game down the stretch, but he also has the cleanest path to retaining the same role. Dawkins is an elite athlete and a great shooter with good size. Sooner or later he’s going to put everything together and be a star. It would be a luxury if he’s able to diversify his offensive game and do more off of the dribble this season, but Michigan might not even need it. Caris LeVert is going to dominate the ball while Derrick Walton and an improved Zak Irvin can also facilitate offense. What Michigan needs from Dawkins is for him to play a similar role to what the Wolverines saw from Glenn Robinson III: finish around the basket, play solid defense, and hopefully provide a more reliable three-point threat. If he can accomplish that, Michigan will be well on its way to a bounce back season in 2015-16.